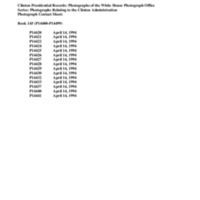 Identifier is exactly "2016-0834-F "
This collection consists of photographs from the Mayors and Law Enforcement Awards event on the South Lawn of the White House on April 14th, 1994. President William Jefferson Clinton delivered a speech and then presented the awards. The collection also contains photographs prior to the event in the Diplomatic Reception Room. Key individuals include Mayor Jerry Abramson, President of the United States Conference of Mayors, Mayor Sharpe James, Mayor Richard Daley, and Mayor Richard Riordan, among others.